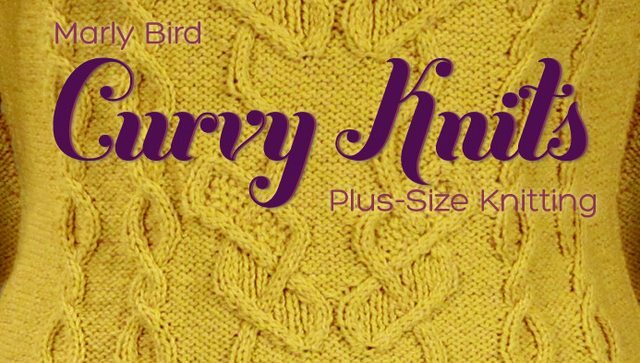 I've just finished watching a Craftsy class - Curvy Knits with Marly Bird - and I thought I'd share some of my thoughts on it. I'm a plus size, there's no denying that. And while I've knit a few sweaters before - and I'm in the middle of several more right now - I'm always worried that after all that work, things won't fit well. Sure, I know some of the principles involved to knit things that fit, but I'm always looking for new tricks - which is why I signed up for this class. The class covers all the main topics for knitting a sweater for plus-size women - taking measurements, knitting a generous swatch, gauge & ease, choosing the right yarn and pattern, and finally getting down to brass tacks and modifying a pattern (covering shaping, short row bust darts, necklines and armholes/sleeves). There are also two 'bonus lessons' at the end - one on blocking, and the other (apropos of very little ;) on recommended knitting-related apps (iOS only). Marly is a bicraftual designer - and she also does a class for Curvy Crochet. Marly is a very charismatic teacher, and just a fun person to watch! She manages to mix real, valuable info (like math for modifying sleeve caps) with funny anecdotes and a pleasant personality. She is also able to talk frankly - which is vital in a class like this, where we have to be honest about how our bodies are shaped in order to achieve a good fit. For instance, when she suggested taking measurements while wearing our 'good bra' - yep, I knew exactly what she was talking about! While there are a lot of tips in the class that are specific to bigger knitters, many of the modifications that Marly explains could be applied to any body type - for instance changing a neckline or adding in bust darts. I thought the class might cover body shapes like Amy Herzog's Fit to Flatter tutorials, but Curvy Knits takes a more intuitive than analytical approach to selecting patterns - you choose some garments out of your closet that you already know suit you well, and you use them as a guide for what you like. The materials included for this class include a ton of worksheets for recording measurements and calculations, along with some extra information. The class materials also include 2 sweater patterns - Darlene Sue, a simple stockinette sweater used for illustrating bust darts and shaping, and Lacey Dream, an open lace cardigan in sportweight yarn. The materials are all laid out nicely, easy to understand and packed with information. Plus, they're broken up into logical sections rather than all bunged into one huge PDF, which was how the materials in the Sizing Knitwear Patterns were formatted. The class materials summarize many of the key points of the class, so they would be useful to keep on your computer, tablet, or phone to refer to after watching the class videos. The examples in the class are all for bottom-up, seamed sweaters, but the principles can easily be applied to any construction. It did throw me for a loop at once point, when I was only paying half-attention and she mentioned 'all 4 armholes of the sweater'... But no, it wasn't a sweater for an octopus, just two separate pieces for front and back. I learned some helpful tips and tricks from this class, and re-enforced ideas that I already knew (yes, a lot of the time it just comes down to knitting a big swatch and doing the math...). And with Marly's bubbly teaching style, I had fun doing it. I would recommend this class! Check it out here.